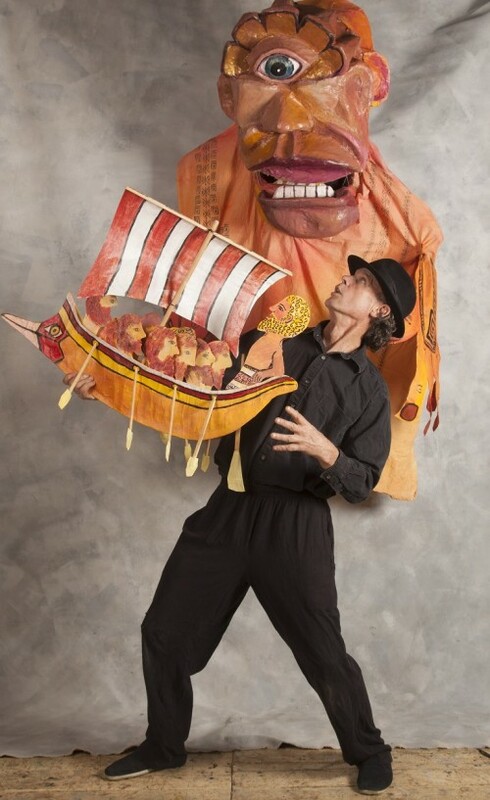 With a colorful cast of characters and deft sleight-of-hand, puppeteer/poet Patrick Wadden brings to life Homer’s ancient epic of Odysseus and his trouble-fraught journey home from the Trojan War. A voyage of two-weeks turns into ten years as capricious gods and wayward mortals thwart the Hero’s passage across the “wine-dark sea”. The infamous one-eyed Polyphemus, the alluring Sirens, six-headed Skylla, and the terrible whirlpool of Charybdis are but a few of the legendary monsters in this timeless adventure story. Through courage, cleverness and determination Odysseus survives these trials and is eventually reunited with his family. Tales From the Odyssey is designed to introduce young audiences (ages 7 & up) and their families to one of the foundational stories of western literature. The visual elements in this poetic presentation are inspired by ancient Greek painted ceramics. This show is designed for small community venues and public libraries.